Can “modern” concepts such as SWR and gain be applied to ULF and ELF antennas? Theoretically speaking yes because they are general parameters. But when the physical dimensions of the antenna are very small compared to the wavelenght, they become useless and almost meaningless. What is, thus, the right way to think at an ULF or ELF antenna? At the resonant frequency (when l=dipole lenght=lambda/2) , XL becomes equal to XC, and so the circuit behaves like a pure resistance Rrad called radiation resistance. Our interest is what happens when l is very small with respect to lambda/2. In this region, the inductance and the radiation resistance are negligible and the model approaches a pure capacitance when the frequency approaches zero. This modelization is also very useful to establish a relationship between the electrical field E of the incoming electromagnetic wave and the voltage available at the antenna terminals when the antenna is not loaded (open circuit). Let us consider, two structures placed above ground irradiated by a vertical polarized ground wave. Since the direction of propagation is parallel to ground, the electrical field (E) vector will be oriented perpendicular to ground. Figure 2: a single plate is placed h meters above ground. It acts as a capacitor to ground and the plate potential referred to ground is given by V = E * h. This configuration is called monopole. Figure 3: two plates are placed h1 meters above ground and h meters one from the other. They act as a capacitor and the differential potential between the two plates is given by V = E * h. This configuration is called dipole. These cases can be generalized and the relationship V=E * heq can be stated even if the shape of the antenna is not a plate. In this case, the parameter heq (equivalent height) is not merely the antenna height but it is a parameter related only to the antenna physical dimensions. The general model for an ULF or ELF antenna (monopole or dipole configuration) irradiated by a ground wave is comprised of a generator and a capacitor connected in series (see figure 4). The generator has a voltage given by E * heq. heq (antenna equivalent height) and Ca (antenna capacitance) are both parameters related only to the geometrical configuration and the physical dimensions of the antenna. Since we are considering a receiving antenna, further considerations can be carried out by attaching an amplifier to the antenna model. Usually, amplifiers employed for ULF or ELF bands exhibit very high input impedance together with a very low noise. Resistors used for antenna loading have high value too, in the range of hundreds of MegaOhms or GigaOhms. Operational amplifiers based on JFET or MOSFET technology are very popular among VLF enthusiasts and many schematics can be found on the net and on this site too. Let us consider now the schematic of a generic ELF/ULF system shown in figure 5. It comprises the antenna, the input resistor R and the amplifier together with their relevant noise sources. The thermal noise of the amplifier characterized by the parameters In and En. The former is the noise associated to the input current drawn by the amplifier (expressed in Ampere/sqrt Hz), the latter is the input referred voltage noise (expressed in Volt/sqrt Hz). Both parameters can be found on the device’s datasheet where they are usually plotted versus frequency. The system’s input is the spectral density of the incoming electrical field E (expressed in Volt/m sqrt Hz ) while the output is the output voltage of the amplifier (expressed in Volt/ sqrt Hz ) to the PC audio card. The system shown in figure 5 can be redrawn embedding all the noise sources into a single generator Eeq called “input equivalent field noise”. In such arrangement (see figure 6) E is the signal to receive, Eeq is the noise while the rest of the circuit is noiseless. 1) The parameter Eeq is inversely proportional to the product heq Ca (and then the signal to noise ratio is directly proportional to heq Ca). Such product can be considered a global performance parameter of the antenna, only dependent on its geometrical configuration. 2) The parameter Eeq is inversely proportional to the frequency (f) (and then the signal to noise ratio is directly proportional to the frequency). This means that low frequencies are harder to receive than higher ones. 3) The parameter Eeq reaches its minimum value (and then the signal to noise ratio reaches its maximum value) when R tends to infinity. This means that it is convenient to set the resistor R at the maximum practical value, usually in the order of few Gigaohms. 4) Equation (4) suggests that In is the most important parameter when looking at an operational amplifier. It becomes the only parameter to take into consideration when R tends to infinity. Next step is to calculate the required value for the antenna gain at 7 Hz and at 80 Hz. We will perform the calculation for two operational amplifiers (AD820 from Analog Device and LT6240 from Linear Technology) and for R=infinity, 5 Gigaohm and 1 Gigaohm. Since R=infinity is not possible (it is only a theoretical limit), the best practical choice is LTC6240 with 5GigaOhm load. To complete our analysis on a minimal E-field receiver we need a method to evaluate the antenna gain defined by equation (3). Equation (8) takes into account only the capacitance between cylinder and infinity but not the capacitance to the ground plane and hence it gives underestimated results. Equation (9) is more accurate because the antenna works without ground plane. Let us go back to the antenna model (see figure 4), considering the current flowing trough the antenna when short circuited. 1) Describe the antenna geometry without voltage or current excitation points. The antenna must not have any feeding point, it must be short circuited. 2) Excite the antenna using a vertical polarized planar wave. The simulator will automatically set the field strength to 1V/m. The excitation frequency must be chosen not too low (the simulator is not intended for electrostatic analysis). A good choice is around 1/20 of the natural resonant frequency of the antenna. 3) Run the simulation and get the current at the segment corresponding to the feeding point. 4) Compute the parameter G using equation (11). E is 1V/m, f is the chosen frequency for the simulation. This NEC2 code describes a 0.6meters high vertical whip divided into 10 segments and placed above an infinite perfectly conductive ground plane. The whip diameter is 2cm. Excitation is accomplished by using a 5Mhz vertical polarized wave. Simulation gives 0.139mA of short circuit current on segment number 1 (the one touching ground). Equation (11) gives 4.4 pFm and so this antenna can be considered minimal. This NEC2 code describes a 1meter long vertical dipole divided into 11 segments and placed 3 meters above an infinite perfectly conductive ground plane. The dipole diameter is 5cm. Simulation gives 0.146mA of short circuit current on segment number 6 (the one at the mid point). Equation (11) gives 4.6 pFm and so this antenna can be considered minimal. This example makes use of the “capacitive hat” method to improve the antenna gain. The antenna is a dipole, 30 cm of total length and 5cm diameter. At the end of both semi-dipoles there are two plates 30x30 cm which act as “capacitive hats”. The whole structure is placed 3 meters above ground. Simulation gives 0.151mA of short circuit current on segment number 3, wire 1. 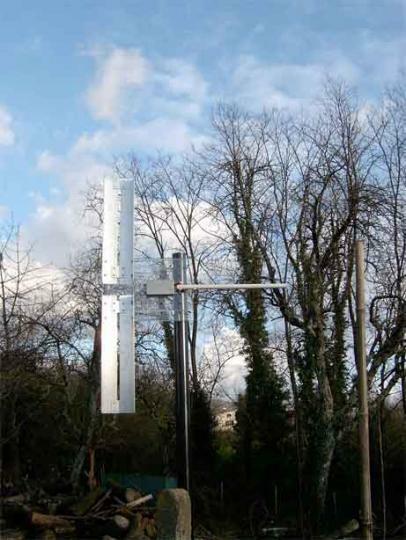 Equation (11) gives 4.8 pFm and so also this antenna can be considered minimal. Just for comparison, let us model the antenna used by IK1QFK for his monitoring station. The antenna is a big “T”, 11 meters high with 45 meters long double hat. Simulation gives 58mA of short circuit current at 1Mhz excitation frequency on segment number 1, wire 1. Equation (11) gives 9230 pFm, about 2200 times the required minimal value. This huge value leads to an extra signal to noise ratio of about +67dB (!!). Now, it is time to experiment our solution, and see if all this mathematics will match the real world. - instead of using a 5cm diameter pipe I preferred to use two L-shaped profiles 5cm x 5cm (it improves the mechanical stability). The total length of the antenna is 1 meter as the original project. - The antenna load is 4 Gohm (2x2Gohm resistors) instead of 5 Gohm because of availability problems on the market. - stage 1 : differential amplifier based on LTC6241. R8 sets the gain. C1,C13 and C2 have been added to limit the amplifier bandwidth to about 1.5Khz. All resistors should be 1% tolerance. - stage 2 : stage 2 : 50Hz notch filter. It is not mandatory but useful to reduce the network hum. It can be bypassed by means of switch J1. Capacitors C3,C4,C7,C8 should be 1% tolerance (possibly silver mica type). - stage 3 : simple 2 poles, 100Hz cut-off filter. It also provides 20dB amplification. - Stage 4 : rechargeable battery and “rail splitter” IC that provides the dual supply needed for the operational amplifiers. Figure 12: Simulated gain (circuit+antenna) expressed in dB. The gain is 42dB while the –3dB lower cut-off frequency is around 3Hz. Figure 13 : Simulated “input equivalent field noise” (circuit+antenna) expressed in µVolt/m sqrt Hz. The cursor set at 7Hz shows a value of 11.7 µVolt/m sqrt Hz that means a S/N ratio of 18.6dB at 7Hz (20dB was the design goal). Finally, here is the antenna at work. The first and most important measurement is the noise margin at the 1st Schumann’s resonance frequency. As previously seen, the electronics is designed to achieve about 19dB using the minimal antenna described in Example 2. Since the antenna we are currently using is not strictly minimal, we expect a margin of more than 20dB. The spectrum above is taken on a calm, sunny day (no wind or clouds!). FFT bandwidth was 0.127Hz, average time was about 20 minutes. The green trace shows the background noise including Schumann’s resonances (1st to 6th), 50Hz and 60Hz hum noise while the red one is the amplifier intrinsic noise. The latter measurement has been made replacing the antenna with a capacitor equivalent to the antenna capacitance (about 10pF). The noise margin was about 20dB exactly as expected!. This confirms our theory. Another interesting reception is the signal coming from ZEVS station. It is a station intended to communicating to the russian nuclear submarine fleet. Here below is the spectrogram taken using 10mHz FFT bandwidth and 20 seconds scroll time. The FSK data and the 82Hz carrier are very clear. The measured signal to noise ratio is 13.6dB. The antenna is very sensitive: a severe problem is the so called “micro phonic effect” , typically caused by the wind. During the experimentation, I noticed that this effect is especially harmful in the 0-40Hz band. Frequencies above 40Hz seems to be not affected by microphonic effects. Another cause of noise are moving objects near the antenna such as tree branches (and also pets running nearby the antenna!). This is because there is often a strong static electrical field (especially in cloudy days) which is perturbed by moving objects. I remember when I was a little child my grandfather used to tell me: “be quiet, we can hear the grass growing...”. The antenna is so sensitive that if placed near the ground in a windy day, it will really detect the perturbation of the static field caused by the grass!. This is a good reason not to use minimal monopoles near ground (as in Example 1). IK5ZPQ Maurizio Gragnani for the mechanical construction of the prototype.